The Cool Route project funded under the Northern Periphery and Arctic Programme and led by the Hincks Centre for Excellence in Entrepreneurship at Cork Institute of Technology is researching all aspects of the logistics, business and marketing planning for a Yacht (sail and motor) cruising ground around the north western coastlines of Europe and Norway. The project with partners in Ireland, Northern Ireland, Scotland the Faroes Island and Norway, also includes all of the major Sailing Organisations in Ireland and The United Kingdom. 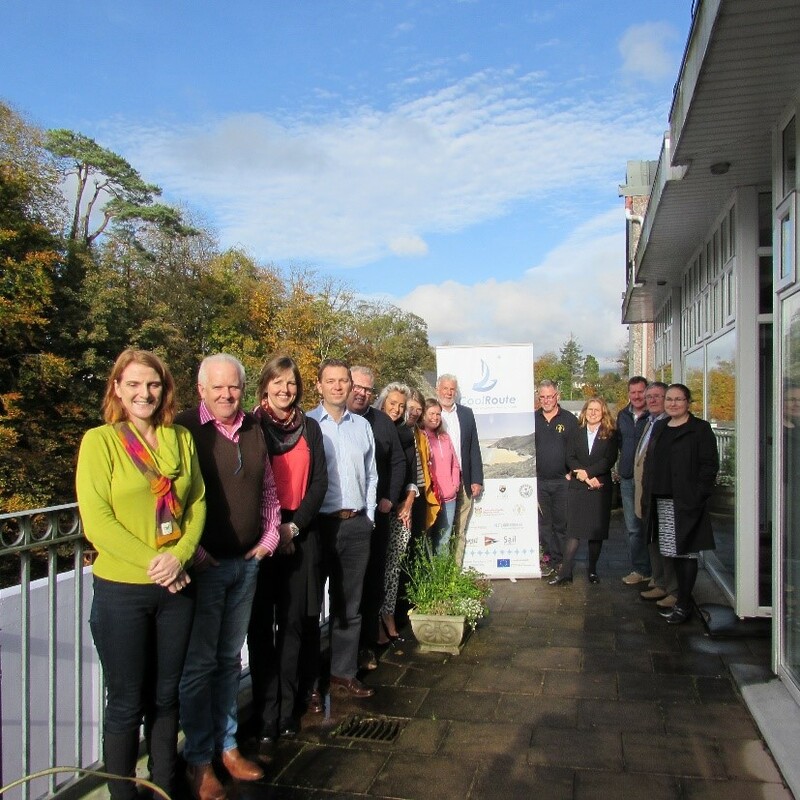 Meeting this week in Donegal, partners warmly welcomed the announcement by partner Sail Scotland that Scotland has been voted the ‘World’s Best Cruising Ground’ in the prestigious Sailing Today Awards – beating even the warm weather destinations of Greece, Turkey, Canaries and St Vincent and the Grenadines. The prestigious Cruising Ground of the Year award which was collected by Gavin McDonagh, Chairman of Sail Scotland, the national marketing organisation for Scottish sailing and marine tourism and a strategic partner in the project to develop the Cool Route. Congratulating the Scottish Cool Route partners, which Include Sail Scotland, British Marine, Glasgow Caledonian University and Blue Seas Marinas Ltd, CIT’s Cool Route Project Manager Dr. Breda Kenny Sheehan stated that “The award confirmed the assertion of partners that mile for mile the Cool Route offered sailing tourists more heritage, culture and culinary experiences than any of the more traditional cruising areas of the Mediterranean or Caribbean seas. Representing the Irish Sailing Association on the Cool Route Steering Committee, Ms. Gail McAlister, ISA Cruising Development Officer, referred to the uniqueness of the Cool Route in terms of its wealth of cetaceans, with a wide variety of whale species being frequently observed on the route, which is also legendary for the extent of dolphin activity. The variety of bird life she stated was also amazing with world famous sea bird colonies, such as these on the Skellig Islands, off the County Kerry Coast. The Cool Route Project which commenced in Mid 2015 is already attracting wide international attention with expressions of interest being made not alone by the cruising and motor yacht communities, but also by the operators of super-yachts who are looking for new high quality experiences for clients in areas where sustainable tourism is of high importance and where people can meet and experiencing new cultures and peoples. The project team is currently undertaking a complete logistical study of the entire route from Cork to Tromsø and a gap analysis, with the objective of having a step ashore landing place at intervals of 25 miles throughout the route, excepting the longer international sea crossings. This work is currently underway and being led by the Glasgow Caledonian University. Meanwhile, Gavin Deane General Manager of the Royal Cork Yacht club and his team are leading the preparation of the Marketing Plan for the overall route and he welcomed that Irish, Northern Ireland and Scottish Partners are already combining in joint marketing activities at events such as the Southampton, London and Scottish Boat shows to market the entirety of the Cool Route, while also promoting their own geographical segments. This he said would be a significant and effective cooperative activity allowing individuals areas of the route to considerably extend their marketing reach to customers in the UK, Scandinavia , on the continent of Europe, USA and Canada. The Donegal meeting hosted by partners Donegal County Council and Donegal Tourism Ltd. also discussed the growing attractiveness of the Cool Route to the “Garden” Cruise liner sector and its particular appeal to very small cruise Liners, which carry up to 80 or 100 passengers and whose size creates a completely different experience and customer offering both onshore and on-board to that of larger cruise ships. These smaller vessels of shallower drafts and possessing an anchoring capability allow easy access to remote areas and harbours. Meanwhile, Dr. Breda Kenny–Sheehan stressed the importance of ongoing stakeholders engagements across the route, while Mr. Gerard O’Donovan, Head of The Faculty of Business and Humanities at CIT noted that the project and its objectives represent an area of considerable economic potential to SMEs of all kinds in remote locations of the Northern Periphery and Arctic Territory, stressing that the major focus of the Cool Route project is on bringing new business opportunities to a wide range of industries, ranging from operators of port facilities to local boatyards, cafes and restaurants, outdoor activity, heritage cultural and other visitor centres throughout the Cool Route. Looking forward into the 21st century, the Royal Cork goes from strength to strength, total membership is around 1500, our facilities are unparalleled in Ireland and continue to expand, major World, European & Irish Championships are hosted in the club regularly.